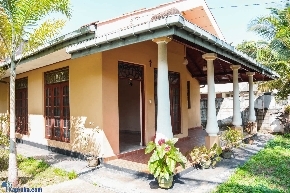 Beautiful House near Maris Stella College, Negombo Hospital, Keels Supermarket, 15 Minutes To Airport And Free Trade Zone, 23 Miles To The Colombo City. This location is very convenient to reach all the super markets, banks, restaurants, bus stand, post office, railway station, park and lovely beach. Open Air space and sitting area to the Entrance, Three Bed Rooms, A/C Master Bed Room, CCTV Camera, Two Receptions, Patio, Dining Room,a large pantry with fitted cupboards - Main Bathroom. Quite Neighborhood, Security Wall Around The Land. Fully Tiled, Over head water tank. Simply Maintaining Garden. Additional Toilet, Shower - Kitchen For Servants, Clear Deeds. Suitable For Foreigners Or Company Executives Or Professionals. Excellent Location. Water: Main Line Water and Overhead Water Tank, There is a well too.